I am always amazed at how many of these luminous women are coming to me to discuss LOVE. Mainly, their frustration at not being able to find a real, rewarding long term relationship. Or, having gone through a challenging and draining relationship, looking for some closure and understanding of what happened. Or, trying to navigate the ups and downs of their current relationship, to find a way to make it work or to be able to move on with grace and ease. If you find yourself in one of these situations, or if as a reader you want to provide support for friend who may be in a romantic dilemma, the Tarot can help. I’m not fond of questions that take away people’s power. A question that often comes up (and I can hear the FRUSTRATION and FATIGUE in the voices as they ask it) is, “Will I ever find my soul mate?”. To me, that question isn’t so useful. It implies that you have no say in the matter, that you can’t take action, that you have to just wait until fate delivers (or withholds) your heart’s desire. And if the answer is YES, then what? Or NO, then what? Try gently shifting the question towards something more empowering, for example, “How can I bring real lasting love into my life?”, or “What do I need to know/release/grow in order to find love?”. These kind of questions can give insight into what may really be going on and helps to formulate a plan of action. The Tarot is a very powerful tool for self-reflection and inner growth. I find that the cards may offer some resistance if you ask questions that infringe on other people’s privacy, or try to see what someone else is thinking or feeling. You will get more useful information by keeping the reading focused on what you (or the client) can do to improve their situation. For example, if you are coming to terms with a relationship that ended badly, rather than asking, “How are they feeling? Are they sorry? Do they regret what they did?”, it may be more powerful to shift the focus and ask, “What purpose did that relationship serve in my life?”, or “What lessons do I need to learn from that relationship?”. Or, “How can I positively move forward now that this relationship has ended?”. Tarot isn’t a magical solution to problems in the love department. (Please see my previous post here). The Tarot can help us understand ourselves more deeply, and can give us an idea of the potential and possibility that is all around us. A Tarot reading can help us to get a wider perspective, to understand what is out there in the world for us, but it is necessary to take action to make it happen. If you don’t act, opportunities may fade away. Ask questions of the cards that will give you (or your client) concrete steps, strategies, inspiration to help them achieve their goals. I always look for the positive in the cards. I find that they are wonderful at offering some kind of hope, practical advice, or motivation. That being said, if you or your client are in a place of pain, fatigue or grief because of a love-related situation, honor and respect these feelings. It usually isn’t helpful to tell someone to cheer up, look on the bright side, let it go and move on with your life. Love is complicated. Life is complicated. Listen to the person, or listen to your own heart, acknowledge what is being experienced right now. You may be the only person who can do this for them. And, when you are ready, start to explore ways to make the present more joyful, and create strategies to make the future even better. If you are looking for love, or if you need some insight into matters of the heart, consult the cards for their unique and profound perspective. They can help you to find love within yourself, put the past in its place, and look towards the future with optimism and a sense of adventure. 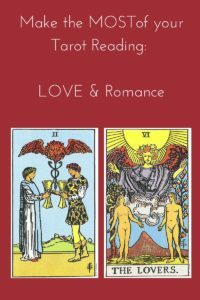 Start writing your own True Love Story today, with the Tarot as your guide! Would you like to consult the cards together? I recommend these powerful and illuminating LOVE email readings…they may be just what you need to increase the love in your life. Book yours today! This is one post in my series,”Make the Most of your Tarot Reading”, designed to help you get a sense of all that the Tarot can do. Stay tuned for more topics!